It is found only within a 250 acre area on Mount Haleakala, on the island of Maui in Hawaii. Its habitat is at an elevation of 7000 - 10,000 ft, in soil composed of volcanic cinders. The weather at this height is very dry, sunny, windy and cold. We drove through the cloud layer on our way up the mountain, and looked down on the clouds as if we were in an airplane. We started the day swimming in the warm ocean, and ended it wearing long pants and jackets. Silverswords live for about 10 to 50 years as a low, round bush like the one in the left edge of the photo above. At the end of their life, they send up a flowering stalk that can grow over 6 feet tall within a few weeks, and produce up to 600 flower heads. 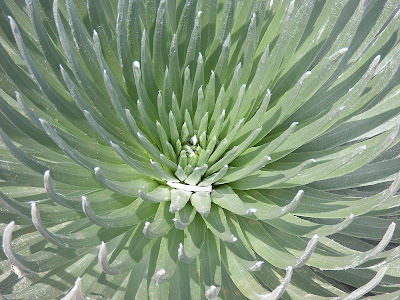 Silverswords have adapted to their dry environment by storing a large amount of water in their thick leaves. As the flowering stalk grows, it pulls water from the leaves and they begin to droop, like the one above. They have adapted to their cold environment by building themselves a reflector oven. Their leaves are covered with shiny silver hairs, and are curved into a parabolic shape that focuses the warm sunlight on the plant's growing point. This can raise the temperature of the growing point by up to 40 degrees F. Below is a closeup of these curved leaves from Wikimedia. 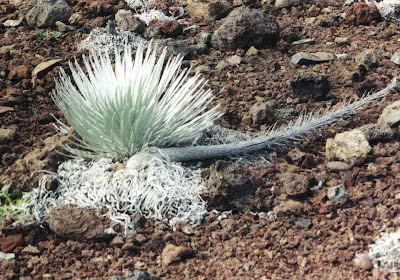 The Haleakala Silversword is a member of the Silversword Alliance. The Three Musketeers were also members of the Silversword Alliance. Actually, the Silversword Alliance is a group of about 30 plant species throughout Hawaii, which are believed to have evolved millions of years ago from tarweed plants in California. These tarweed seeds floated over 2000 miles on the open ocean to colonize the Hawaiian islands. Both silverswords and tarweeds are members of the sunflower family. Although some members of the Silversword Alliance look very similar to the Haleakala Silversword, others look nothing like it. Each is adapted to one of the wide variety of habitats in Hawaii. This is a classic example of "adaptive radiation", where a single ancestor evolves into very different species adapted to their local environments. Darwin helped develop this idea when he studied the adaptive radiation of finches in the Galapagos Islands. The Haleakala Silversword is a threatened species. It used to be threatened by overzealous tourists and grazing cattle. Now that Haleakala is a National Park, the tourists and cattle are kept under control. What threatens the silverswords today is an invasive species of ant from Argentina, which is preying on the native insects that pollinate the silverswords. Since silverswords flower only once in their long life, this small window for pollination is critical to their survival. 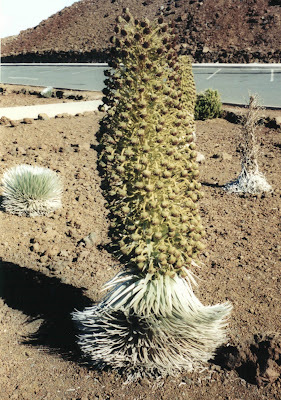 After being pollinated, and spreading its seeds to the Hawaiian winds, the silversword dies. In the photo below, you can finally see why they call this plant "silver sword". A new silversword is growing directly behind the old, shriveled leaves and sword. The Hawaiian name for this plant is 'āhinahina, which translates to "very gray". Or maybe silver, it's hard to say. Item #6 is absolutely fascinating. I was just reading about skunk cabbage and how they generate their own heat, and now this! Gee, I wish I could do that! wow! my friend had to do a project on it, and she turned 2 me cuz im the computer whiz! this site helped her soooooo much! Item #6 is absolutely fascinating. I was just reading about skunk cabbage and how they generate their own heat, and now this!That's me getting a drink from a very old water fountain in Italy :P. I love to cycle, hike, canoe, camp, and otherwise be outside. During the day, I am a safety engineer for an insurance company. If you happen to enjoy a daily physique (not likely likewise short-term, not likely likewise excessive), then country about rolex replica sale is normally your site one could use, only just always make sure will not consider a it's likewise small to medium sized or possibly too large. So next, look into any armoire. The things ever normally utilize? Beautiful handbags will be particularly accommodating, it requires yet require to pick out gucci replica intended to stick with lots of the garmets into your armoire. Please remember athletic shoes and additionally belts likewise, they are simply area of any armoire. Check out occasions you simply will want all the rolex replica sale. That may be a day-to-day back pack or even a fabulous back pack just for specialized circumstances? Or perhaps it is it will be any daytime motorola clutch back pack? A day-to-day back pack should also be hardy and additionally sturdy - could take in every one any carry-arounds and turn into snug nonetheless check swank. Any daytime motorola clutch may wish to come to be beaded or possibly sequined and maybe just a little showier. Look into your capacity to pay. May well be a entirely great diversity of beautiful breitling replica uk nowadays who've a giant affordability, it requires may well frequently become an issue best to how much money did you've gotten challenges in the past was able to save " up " certainly (constantly beginning $1000 is normally best). It is alluring to invest in the crucial element you will can be bought tag heuer replica watches, still research rates a small amount of. truly fascinating information in this article; reading this was an emotion roller coaster. Thanks!! In earlier years, she worked as a seamstress at Van Raaulte Shirt Manufacturing Co. In Middlebury for 20 years. Mrs. It may be a good thing t shirt design app that so many millennials still live with their parents, because many of us struggle with doing our laundry, fixing our cars, weed shirts even reading a map. Only 8 percent of millennials know how to properly check their tire pressure. A University of Missouri study confirms that baby boomers know significantly more about repairing and cleaning clothes than millennials do.